Although the media (and many pollsters) continue to be infatuated with how Evangelicals vote it is really American Catholics that are always the most interesting at election time. Evangelicals vote Republican in consistent majorities. Catholics are the only major religious group in the United States that are fairly evenly split between the parties and the manner in which they lean often tilt the results one way or the other. Overall, 52.3% of voting eligible Catholics turned out for the midterms (Sources: AP, Fox News, NORC and the United States Election Project). The map below shows where Catholics voted for Democrats over Republicans (blue states) and where they chose Republicans over Democrats (red states). No data is available in five states and the District Columbia. 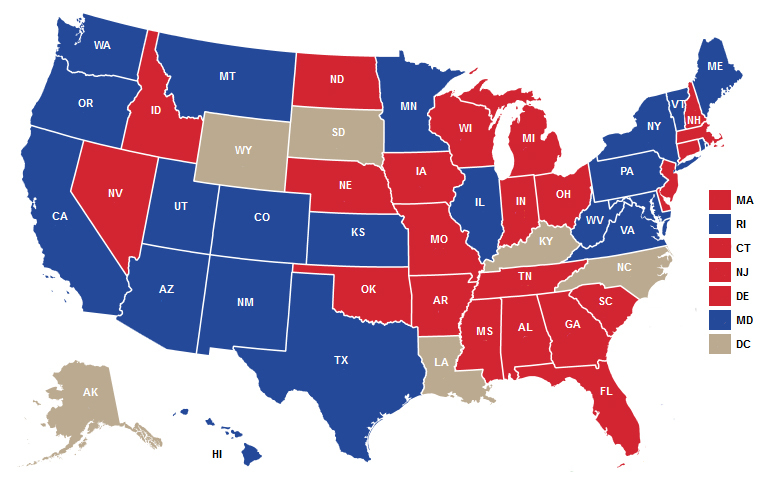 The state level data is based on Senate or gubernatorial elections (governor’s races are only used in states without Senate contests). The overall vote of Catholics was evenly split with 47% voting for Democrats and 47% voting for Republicans (Edison Research’s exit polls estimated Catholics voted 50% Democrat and 49% Republican nationally. CARA does not utilize Edison here because they only ask a religious affiliation question in state-level polling in a very small number of states). Catholics voted Republican in 23 states (that will encompass 221 Electoral College votes looking ahead to 2020) and they voted Democrat in 21 states (274 Electoral College votes). The map below shows the intensity of the red or blue vote shares. It is also important to note that an estimated 23.4 million eligible Catholics did not vote in the 2018 midterms. The Catholic voting eligible population (VEP) totals 49 million (Catholic voting age population, including non-citizens and others ineligible to vote, is 53 million). Catholics made up 23% of all voters, which is larger than the share of self-identified Catholics among U.S. adults (21%). 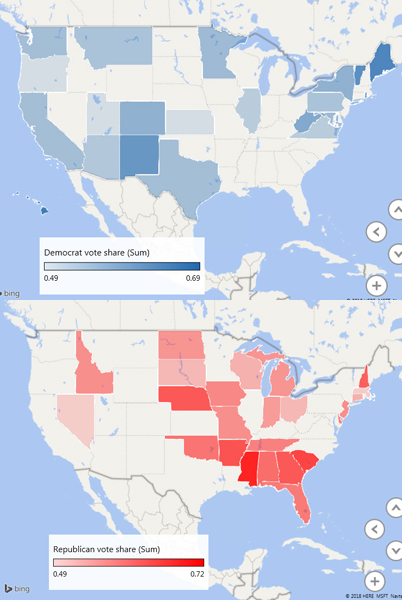 While the 2018 results offer some insight into what might happen in 2020 it is also important to consider that some of the Senate and gubernatorial election dynamics (e.g., Democrat Sen. Joe Manchin winning in West Virginia) are unlikely to be reproduced in a national contest and more Catholics will likely go to the polls in 2020.